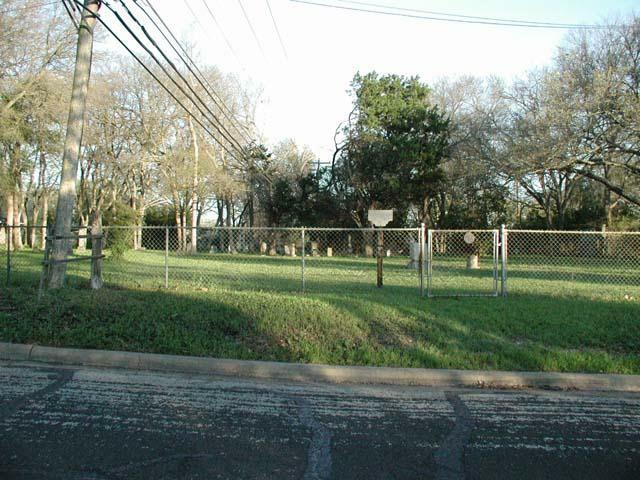 The Davis Cemetery is located in the middle of a neighborhood, not far from Shoal Creek and only a couple of blocks south of Northwest District Park. Don't try to find it on Yahoo Maps. For some reason Vine does not show up. If you find the intersection of Cavileer and Wilbur Drive you're only a half block to the east. When the cemetery opened in 1845 the surrounding area consisted of farm land and contrasts sharply with the houses that surround it today. The cemetery was originally conceived as a family plot for the Davis family. George W. Davis was a veteran of the Texas war for independence who fought at the Battle of San Jacinto and it was he who established the resting place. 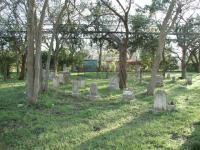 Eventually, other inhabitants of the area were buried up until 1918 when the cemetery was closed. 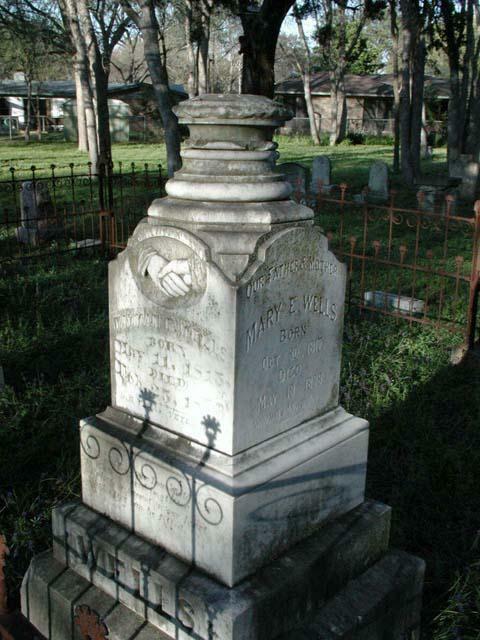 Among the stories one can discover at this cemetery is the Williams family who appear to have lost at least 3 children, most very young, within a 9 year period between 1869-1878. Seeing such a display reminds one that many of the tough times today pale in comparison to that which was borne by the earlier Austinites. Mr. England was obviously fond of his consort, who passed away at the age of 28. He erected one of the larger monuments in her honor. One of the more elaborate monuments. Note the houses in background. Among the surnames you can find include Adkisson, Bacon, Davis, England, Hays, Jones, Robinson, Walden, Wells, West and Williams. In all, about 100 people are buried here, though tombstones remain for at best half of that population today. The cemetery is fenced, but the gate was unlocked. 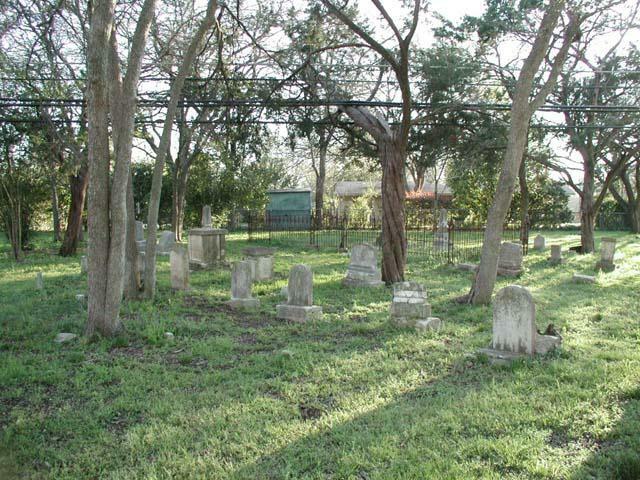 The grounds are very well kept, considering that the cemetery has been closed since 1918. We're uncertain if a neighbor or a neighborhood association performs these duties. 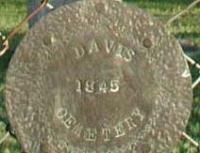 Some of the damaged tombstones show signs of patching and some of the more severly damaged have been augmented with hammered steel plates listing names and dates. 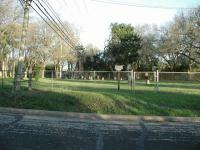 One odd feature of the cemetery is the telephone lines that cross the lot, very close to the ground. You might be able to see this in the pictures. The lines rub along one of the trees. Sooner or later the city will have to do something about the lines and/or the tree. Parking is possible on Vine. Chances are you won't run into anyone else there, so congestion is not a problem. Stopped by this cemetery since I hadn't logged my visit when I documentated it some time back. It looks largely the same except the low hanging telephone wire seems to have been fixed. A guy on a motorcycle stopped to take a picture of Mr. England's consort's grave. I'm not sure what that was all about!